Cellulose is resistant to fire. It is not required to be separated from interior space because it will not ignite readily when exposed to fire. Actually, cellulose insulation is officially classified by building codes as fire blocking material, which slows the spread of fire through closed cavities in building assemblies. See the short video below to see the cellulose’s ability to slow the spread of fire in a structure. 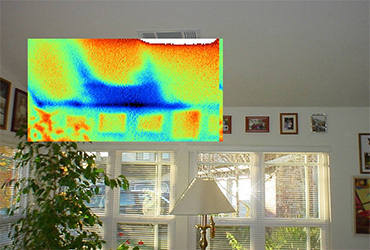 Our trained professionals will perform a visual inspection and thermal scan, and provide insight, options and pricing on money-saving improvements. You will be provided costs per option. We will also help navigate subsidy and incentive programs available through the State and Federal governments, as well as those offered by utility companies. Locally owned – we are proud to be locally owned and operated. This gives us complete control of our quality, our pricing, and our schedule. Knowledgeable staff – Over 85 years combined construction experience. Best pricing in the Pittsburgh market – Our material buying power and low overhead means we can pass the savings onto our customers. We have worked for the big box stores and know that we are typically ½ the cost of their insulation services. Best equipment - Our quality blowing equipment, including the CM3500, saves us costly time on the job and ensures a quality job every time. Free estimates - all home inspections and written, detailed estimates are free of cost. We will never require a down payment for our work. We ask for full payment upon completion and acceptance of our work. We strive to schedule an installation that works for the homeowner, even if that means night or weekend work. On the day of installation, we will protect the finishes and furniture of your home in our path of work. When we quote an R-value, we will provide at least the specified thickness or greater. Beware of insulators that provide less insulation than agreed. See what others have to say at Angie’s List.